Go to www.sdltrados.com > Login > Downloads and download Multiterm Desktop and Studio. Install both of them. Run Studio and when you’re asked to activate it, just keep it in the 30-day Demo mode for the time being. Don’t run Multiterm until you’ve activated your license (see the end of this post). The downloaded version of Studio doesn’t include any Cumulative Updates, so it’s important to go straight to Help > Check for Updates and follow the instructions there. If you want to change the Studio interface language, go to View > User Interface Language and select another language. The new language will kick in when you next start Studio. Now go back to your old computer. Your user profile contains customised shortcuts, window layout, default languages and everything else that you’ve defined under General Options. To export your user profile, go to File > Setup > Manage User Profiles > Export user settings and follow the wizard to export your settings onto a pendrive or other device. Now import your saved user profile in your new computer using the “Change user profile” wizard in the same location. You can also import it earlier on when you’re running Studio for the first time. You’ll want to transfer all your translation memories, autosuggest dictionaries and termbases. Hopefully you know where you save all these resources, so they’ll be easy to find and copy onto your pendrive. Custom dictionary: To move the custom dictionary (where you add words to the spell checker), make sure you know which dictionary you’re using by going to File > Options > Editor > Spelling. If you use the Hunspell Spell Checker, copy your custom dictionary from C :\Users\[Username]\App Data\Roaming\SDL\SpellChecker\CUSTOM.dic and transfer it to the same path in your new machine. If you use the MS Word Spell Checker, copy your custom dictionary from C:\Users\[Username]\AppData\Roaming\Microsoft\UProof and transfer it to the same path in your new machine. AutoText: Export the lists you’ve created for each language by going to File > Options > AutoSuggest > AutoText and follow the export wizard. Now import the AutoText in your new computer and copy all your data. AutoCorrect: To export your AutoCorrect settings in Studio 2015, go to File > Options > Editor > AutoCorrect and click Export Settings. Note that it shouldn’t be necessary to export the AutoText and AutoCorrect files at all, because they will be transferred as part of your user profile. You can copy and recreate Studio projects in your new machine by copying the project folders and the .sdlproj file, but make sure you reproduce exactly the same paths for all the resources that are in each project. If Studio can’t find a certain TM because the path has changed, it’ll make a fuss every time it opens and that can be awkward to sort out. I decided to start my projects from scratch on my new computer. I must admit I didn’t realise how time consuming this part would be. 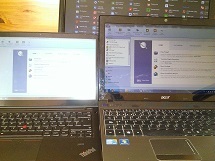 Open Exchange apps have to be installed on your new machine one by one. For my fresh installation, I decided to download all the apps again from the Open Exchange to make sure I was using the latest versions. In the case of standalone apps, and if you’ve still got the .exe or .msi files in the Downloads folder on your old machine, you could copy them and install them on the new one. to the same place on your new machine after you’ve re-installed the app. If you’ve paid for any apps you’ll have the extra job of re-activating the license. The new Studio app RSS feed is great to keep track of new apps when they’re released. Most people know that this is an essential step before you finally retire your old computer. When you’re sure that you’ve got Studio running smoothly on your new computer, the last step is to return your license on the old one. Open Studio for one last time on your old computer and go to Help > Product Activation > Deactivate. That returns your license to SDL. Note: Later, if you want to check something on your old machine and haven’t got the Freelance Plus version, simply deactivate the license temporarily on the new one and activate it again on the old one. I’ve now had two machines that have had issues with the Studio license getting ‘trapped’ in the Ethernet address (when connecting with a LAN cable) or in the Disk ID (when connecting by WiFi). The result is that Studio is activated and opens only when I connect using that same method, and it won’t open at all in flight mode. A laptop docking station might further complicate the issue. One unexpected solution was to ‘pretend’ I was connected with a cable. Amazing, but it worked! SDL Support helped me with the issue and one of their suggestions was that I should deactivate my license from Studio before changing networks, and then activate again after the change. My advice for anyone licensing Studio for the first time is to do it using WiFi and without any docking station in place. That combination seems to work. Getting Studio up and running on a new machine takes time and careful planning, but it’s definitely worth the effort. My new Lenovo Thinkpad S440 with its Haswell processor and SSD is lightning fast. It starts Studio, prepares projects, looks up segments in big TMs and autopropagates numbers in next to no time. I don’t even have an excuse to get up and make myself a coffee any more. The above instructions worked for me but they may not work for you because computer set ups vary hugely. Follow the instructions at your own risk. You’re entitled to free help on installation and licensing issues, even if you don’t have a support contract. To contact SDL, go to the Solution Finder and troubleshoot your problem or log a support request. [Added in 2016] For general questions, go to SDL Community. This entry was posted in 2. Beyond the Basics, SDL Trados Studio and tagged how-to, new computer, Open Exchange, SDL, Studio, Studio 2014, Trados, Translation memory, update. Bookmark the permalink. Hi Emma–great resource and thanks for pointing me in the right direction. Running smoothly now on my new machine. If you just have one default template, it’s probably easier to re-create it from scratch, but I had several projects, each with dedicated TMs and some with dedicated glossaries. Thanks for this note, Joel. It’ll be very useful for people who want to transfer their project templates. Pingback: (CAT) – How to transfer SDL Trados Studio to a new computer | Emma Goldsmith | Glossarissimo! And its timing is just perfect because I’m about to start helping a friend (and a colleague) to transfer Studio to a new computer and this article will save me a lot of explaining and time. Good advice about recreating the projects from scratch rather than transferring them. I think that it is the best approach most of the time because It reduces the likelihood of errors due to path conflicts, and also serve as a good opportunity to rethink a little the whole project workflow and make the necessary adjustments (remove some, update others, etc.). The licensing mechanism and OX apps are a bit of a pain to deal with. I would love to see a better mechanism for handling both, but this is a topic for another discussion. Oh, and thank you very much for mentioning my blog article :). Appreciated. So glad that this article was timely for you, Shai, although I’m sure you don’t need the instructions yourself! I learnt the trick of starting projects from scratch when I had a recurring error to do with updating fields in TMs. It turned out I was using a project dating back to early Studio 2011 days. Starting afresh solved the problem. Hi Emma. A nice and useful article. I would like to add one thing about Java. You don’t need to uninstall the 64-bit version. Both 32-bit and 64-bit versions can coexist on the same machine. Moreover, I would definitely recommend to have them both because otherwise you may receive complaints from some 64-bit applications that you don’t have Java on your PC. The only inconvenience is that the Java updater will update only one of the versions. So I always download the other version from the Oracle website and install it manually when a new version has been released. That’s interesting, Jānis, I didn’t know that the 32-bit and 64-bit versions of Java could and actually should be installed side by side. Thanks for your comment. Indeed, Emma, for your information 32 bits programs are installed in “C:\Program Files (x86)” in Windows, whereas 64 bits programs are stored in “C:\Program Files”. Thanks, Franck, that’s a useful tip! Just wanted to thank you for this and your post on transferring other useful programs – I’m now up and running on my new computer and I’m sure it would have been a far longer, more painful process without your clear, easy to follow instructions! So glad these instructions worked for you, Carol. Enjoy your new computer! Thanks Emma, I have just taken the plunge and bought Trados 2014. My computer is usually stable, but it has crashed in the past, so I was wondering whether you would recommend I deactivate Trados at the end of each session before switching off? Good question. No, I wouldn’t recommend deactivating your Studio license at the end of each session. It shouldn’t be necessary, unless, as you say, your computer dies all of a sudden. SDL will reset licenses that have been lost under those circumstances and they usually do it within one working day. If your computer needs to be reset or if you have to reformat your hard disk you’re right about returning your license beforehand. Restoring your computer to a previous point shouldn’t hurt the Studio license though. Yes, you have helped a lot, thanks! This concern was actually one reason (that and the price!!) I held off getting Trados for such a long time. I feel reassured now that I can use it as I can any other CAT tool now without taking extreme safety measures. Thank you Emma, I’m just about to use your helpful instructions to transfer Trados Studio to my new laptop… here goes! What helpful instructions! Just a question: after returning my Studio (2011) license from the old computer, have I to return the Multiterm license as well? I’ll do it just before my old machine goes away and will not be able to return on it when the new one is installed. Hi Gisele. Multiterm doesn’t have a separate license even though it’s a separate download. It’s part of the Studio license. Oh yes, you’re right! Thank you again. One last question if you don’t mind. I’ll transfer my MS Office 2007 to my new computer. When I download SDL Studio 2011 again, will I have to search and install the Trados8.dtm plug-in for Word as well? This topic is confusing when searching on Google/ProZ. If you want to install Trados 2007 then, yes, you’ll have to locate the Trados8.dotm add-in and put it into your Word start-up folder. But Studio doesn’t need it. I need to reinstall Windows on my computer which involves first transferring all my files to a temporary drive and then retransferring them back to my PC. If I understand correctly there shouldn’t be any risk of losing my translation memories; however I would need to deactivate my licence and then reactivate it when reinstalling Studio? What would happen if I didn’t deactivate? Thanks in advance for any clarifications or tips. There’s no risk of losing your translation memories or other resources if you follow points 2, 3 and 4 in my post. Yes, you have to return your license. If you don’t, you’ll have to fill in the form in the SDL KB solution finder under the section “I need to have my license reset”. SDL is pretty fast at sorting this out, but it’s much better to return the license in the first place and avoid unnecessary headaches. Good luck with the clean installation! 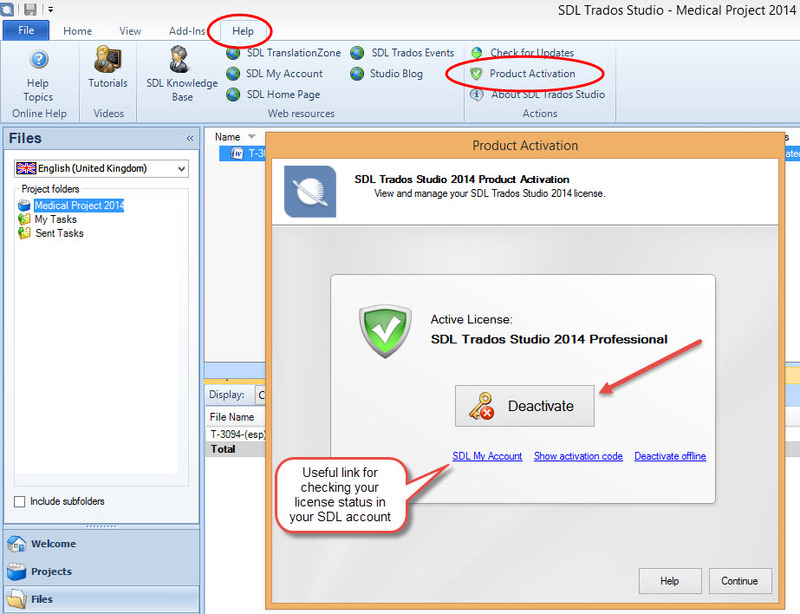 An error occurred while installing system components for SDL Trados Studio 2014 SP1. Setup cannot continue until all system components have been successfully installed. Component Microsoft .NET Framework 4 (x86 and x64) has failed to install with the following error message: „A failure occurred attempting to install the .NET Framework 4 Full.“ The following components failed to install : – Microsoft .NET Framework 4 (x86 and x64) See the setup log file located at ’C:/Users/padmin/AppData/Local/Temp/VSD201E.tmp/install.log‘ for more information. Hope it sorts your problem. If not, SDL provides fast, free support for installation and licensing issues through the Solution Finder. Thanks again, Emma. I was optimistic that your link held the answer to my woes but I’m still not out of the woods. I guess I’ll try contacting SDL for support. Happy to report that I’m mostly up and running. The instructions of the above link worked well save for the glitch which was that when I entered the command “net stop WuAuServ” I got a System 5 error. The workaround to that is to run the Prompt Command as an administrator. Comments on this post are now closed. If you need help with Studio issues, I recommend the Studio User group on Yahoo Groups or the SDL Trados support forum on ProZ. If you’d like my advice about solving specific Studio issues or personal guidance as you start out with Studio, please click the contact tab above to arrange a consultancy session.